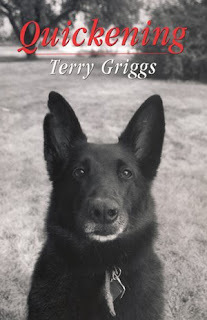 The timing was quite fortuitous in my discovery of Terry Griggs. (My discovery of her for myself, I mean, for Griggs is already well recognized, having published five books, including two novels, two children's novels, and the Governor General's Award-nominated short story collection Quickening. She was awarded the Marian Engel Award in 2003). I read her short fiction first in Canadian Notes and Queries 76, which was the infamous Salon Des Refuses issue, and then in The New Quarterly 108. I found that Griggs' narrative voice had the force of a hurricane, the fortuitousness being that when I wanted more of it, I had not long to wait. 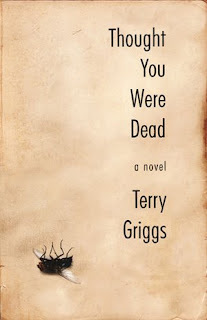 Her new novel Thought You Were Dead was released earlier this month with Biblioasis, and her 1990 collection Quickening has been reprinted as part of the Biblioasis Renditions series. Thought You Were Dead takes the crime novel formula and turns it on its head with such a literary consciousness that book reviewer becomes uncomfortable using such cliches as "turns it on its head." Literary consciousness is not to mean hoity-toity here, however, or obnoxiously academic, seeing as Detective Chellis Beith only possesses one half of an English degree. Rather that this is a novel very conscious of itself as a book, written by an in author in full possession of her tools at work (which are words). With its tongue in its cheek, sending up the genre-- Chellis Beith isn't even a detective, though he's frequently accused of being one. Instead, however, he is a literary researcher, formerly a grocery store stock boy, snatched up by a best-selling author one day in the ValuMart "along with the gherkins and the Melba toast." Griggs' fiction is as demanding as it is rewarding, pulling no punches at all. The reader is plunged rather than eased into the story, whose language must be untangled, unraveled in order to work out the plot. Chellis Beith may be a slacker, but Terry Griggs is no such thing, her tangling and raveling deliberate and intricate, sending up crime fiction, small-town culture, and the literary life. And so much more, this becoming clear with every rereading, with every sentence picked apart, with every one closely read. What a richly textured lark is this, how substantial is Terry Grigg's concept of whimsy. With Quickening, which is a very different kind of book, stories that were written a long time ago, it becomes clear that textured larks and substantial whimsy have always been Griggs' way. These stories of island life are various, but linked by their connections to water (swim lit, however darkly, much to my delight), to vanishings, unlikely points of views (by babies, dogs, and fetuses). These are short stories with limits that are elastic, stretching to accommodate narrative shapes that are "tetrahedral in complexity". Which isn't easy. But in her foreword to this reprinting, Griggs notes just what she demands of her readers: "If the gist of any particular effort here seems overly elusive, a reader might need to venture in like a beater and drive out the game." What a novel challenge to have posed, and we're better readers for it. *UPDATE: Terry Griggs has penned today's Tuesday Essay in The Globe & Mail.